Hello Tutti fans! Autumn with you today to share a mixed media Christmas card featuring our new Madonna die. I embossed my die cut by tapping it with my Versamark ink pad and covering with gold EP then heating. I just love this look! I layered over an inky panel made with Distress Ink. I made another DI panel and embossed the scripture in gold and then stamped an elegant snowflake all over the panel. So easy and so fun! I hope you are inspired to begin your Christmas card stash today. 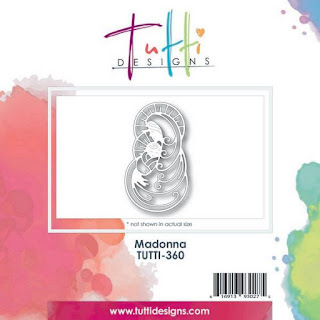 and purchase your Madonna die HERE today! STUNNING card! Those traditional Christmas colors are my favorites and adding that richly embossed Madonna die cut makes for a super elegant design! Beautiful work on that background, too! This is beautiful! I adore your pretty background and that gorgeous die cut in gold! Your lovely sentiment embossed in gold is perfect! Just beautiful! Love the die and the backgrounds you made to highlight it - your embossed scripture is perfect! Hugs! !